On a summer afternoon with life jacket-less tubers bobbing by, teenagers jumping off cliffs and dogs fetching sticks, it’s hard to believe the Puntledge River is famous among whitewater paddlers. But when regular flows double or triple the humble river becomes mighty. While those moments of fury are dependent on rainfall most of the year, one weekend every spring BC Hydro guarantees perfect paddling levels and boaters from all over the world descend on Courtenay for the annual Puntledge River Paddling Festival. The festival emerged out of the Puntledge Water Use Plan, three years of meetings between BC Hydro and various stakeholders including recreational boaters. 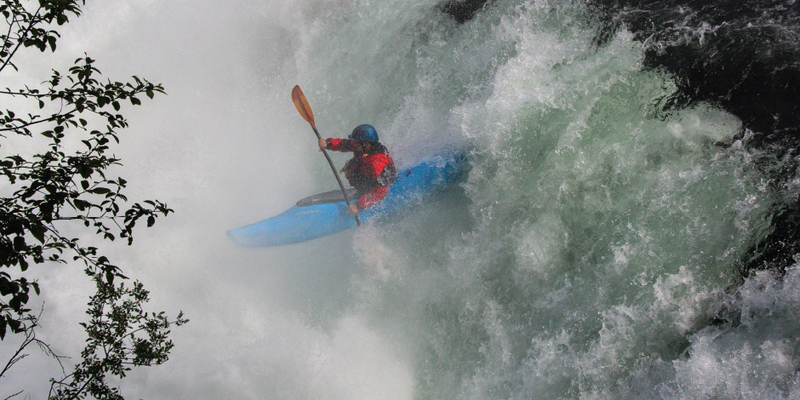 The paddlers hoped to win more high flow days on the river. Most of the other stakeholders wanted lower flows. But slowly the paddlers convinced them that the river was world class and, if carefully planned, the high water events would have negligible impact. When the final plan was adopted in 2005 the Puntledge was the only one of BC Hydro’s 23 rivers with a guaranteed paddling flow, says Stephen Watson, BC Hydro’s community liaison on the island. The festival takes place between May 15 and June 15, the exact date set with feedback from BC Hydro and Fisheries and Oceans Canada to help flush Chinook salmon fry past ravenous seals waiting near the river mouth. And while the gush of water looks to many as a net loss in power generation and drinking water, the timing is purposefully set to coincide with the biggest inflows of the year. In all but two years the BC Hydro generators ran throughout the festival weekend. And even in dry years, when the generators sat idle, there was no impact on drinking water as the dam refilled itself within days, says Watson. Overwhelmingly, he thinks the festival has shown itself to be an economic benefit for the Comox Valley. Heading into it’s ninth iteration, the festival typically begins with a trickle. Paddlers begin arriving on Wednesday or Thursday and by Saturday 200 to 250 of them are in the valley buying gas, groceries, meals and coffee. The majority camp in the Maple Pool Campsite, the festival’s base, right on the river and within ear shot of the rising water. While most paddlers stick to the “play run,” between the powerlines near Powerhouse Road and the Condensory Bridge, at lunch time on Saturday a few of the more skilled head to the upper river to run the extreme creeking section. Putting in near the upper fish hatchery on Forbidden Plateau Road they run the series of steep ledges to Nymph Falls and on to the main event, the big drops of Stotan Falls. On Saturday night local bands and DJs fuel a party. When Sunday morning creeps around BC Hydro cranks flows even higher and the paddlers repeat the fun of yesterday. Throughout the weekend non-paddlers can hop aboard commercial raft trips down the river, join beginner kayak lessons or just watch paddlers run Stotan Falls. By Monday, the paddlers are gone and the river is back to normal, just the humble Puntledge gurgling through Courtenay.